Another one of my Pretty Serious untrieds from the middle of the year, and really why oh why have I waited so long? It is absolutely gorgeous! I'm talking about Pretty Serious Eye Of Copernicus the most beautiful night sky with a thousand stars. Pure squishy jelly heaven. 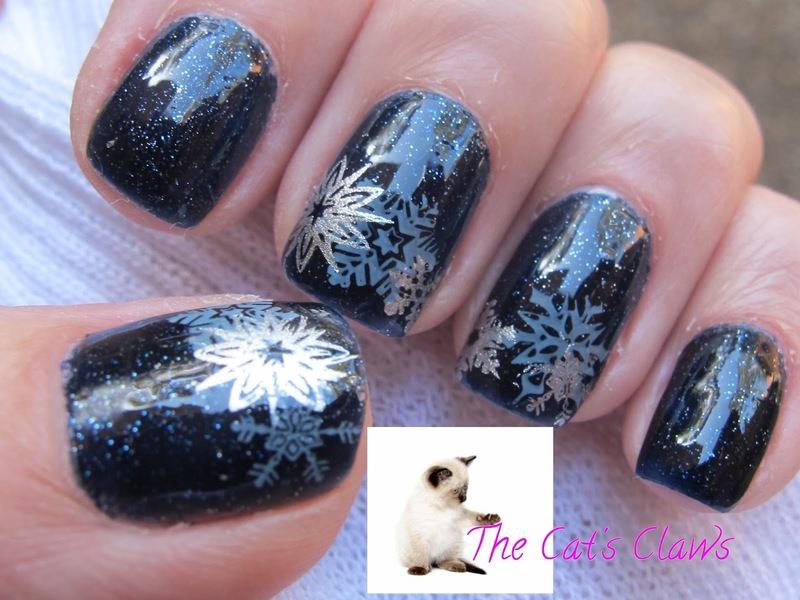 On to my mani then, being lost in the wonder that is Eye Of Copernicus there was only one thing I could think of to stamp and that was snowflakes from MoYou London Festive Collection 02 using Barry M Gelly Elderberry a grey/blue and Cult Nails Lethal a bright silver foil. I didn't really need a top coat on Eye Of Copernicus by itself as it is fabulously glossy, but I top coated the the stamping with Seche Vite and so my plain nails got a top coat too. OMG! 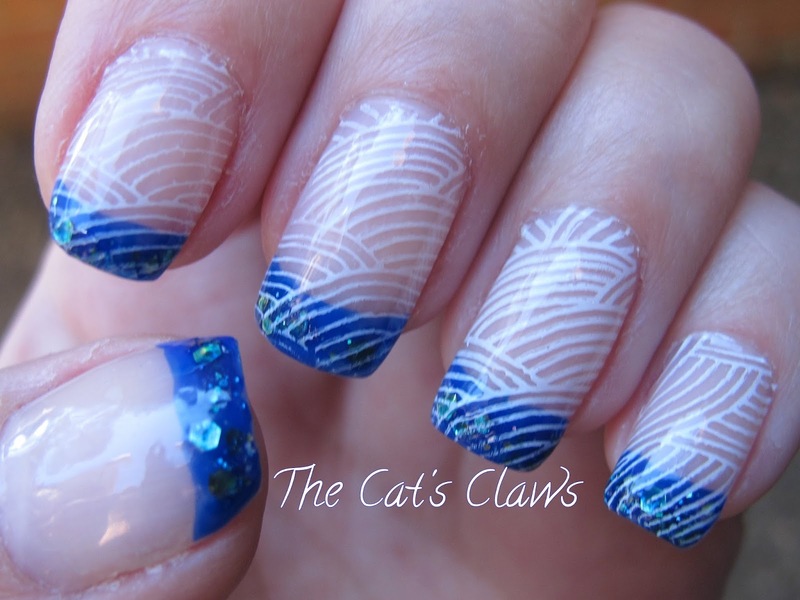 I don't know how long I have been away, but in that time I have worn countless mani's but not much nail art. I have taken photo's but that is as far as it got. Anyway moving on, Chanel have bought out their new Christmas Winter collection and the make up is gorgeous but the polish not so much so. What has this got to do with Pretty Serious Kashmir I hear you all ask? Well Pretty Serious Kashmir released in May 2015 (I know so slack) and only recently worn for the first time by me fits right in with those deep luscious berry shades that Chanel are only now touting! Actually this is the second time I have worn Kashmir, as I keep going back to it as it is just so pretty in person being a deep berry purple with a ton of shimmer, flecks and flakies. 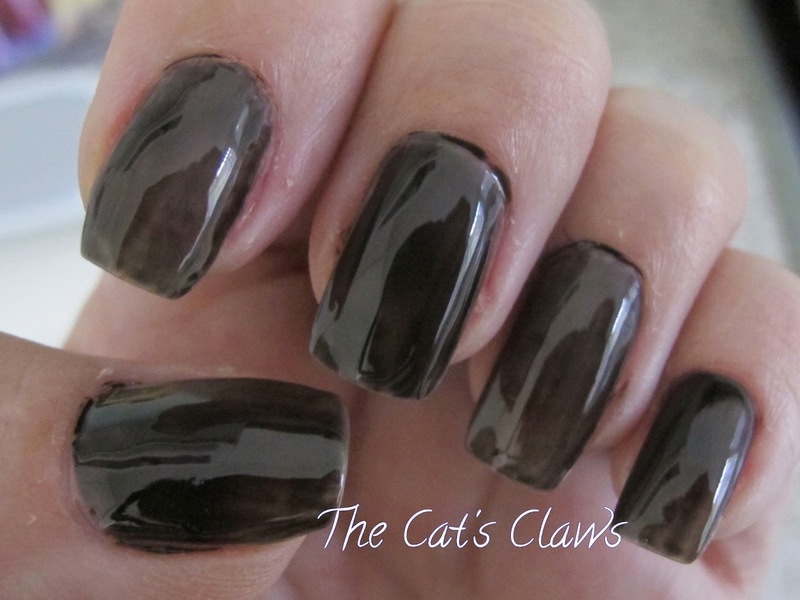 This was two coats which applied perfectly and then a top coat of Seche Vite. I then did the gardening before realising I hadn't taken any photos so another quick coat of Seche Vite and I was good to go! I must admit I love grey polish and Iktsuarpok is a beautiful and very sophisticated medium grey creme with silver flakes. Its designed by Hannah from Polly Polish for Pretty Serious. 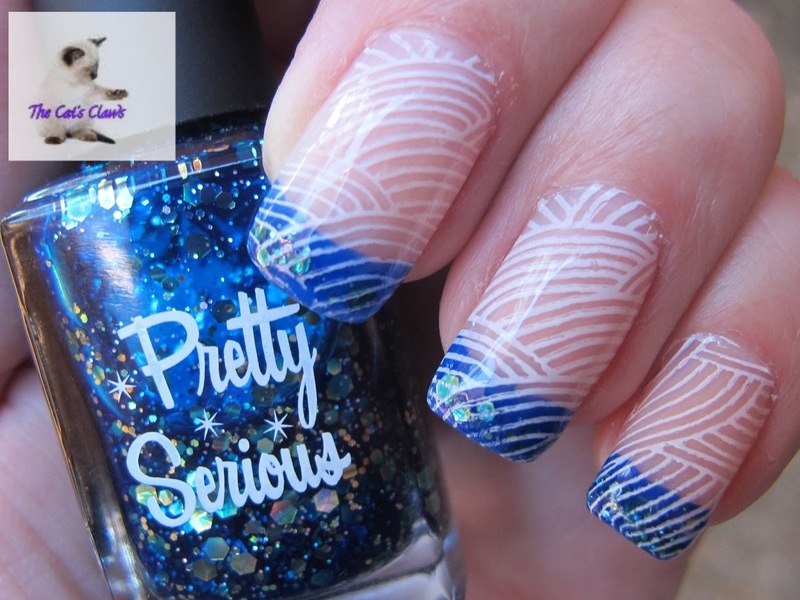 Pretty Serious polishes apply beautiful and I would say are on par with the more high end nail polishes. On to my mani then, two coats of Pretty Serious Iktsurpok stamped with Uber Chic Plate 3-02 using Kleancolor Metallic Black. Followed by a Seche Vite top coat. Having not worn nail polish for two days everyone and their dog had something to say on the subject, so this mani was met with great interest. And one of the best questions was if my mani was Gucci! Enchanted Polish Octopus's Garden is absolutely gorgeous in real life and unfortunately the camera has only picked up a tiny bit of that gorgeousness. I.e. 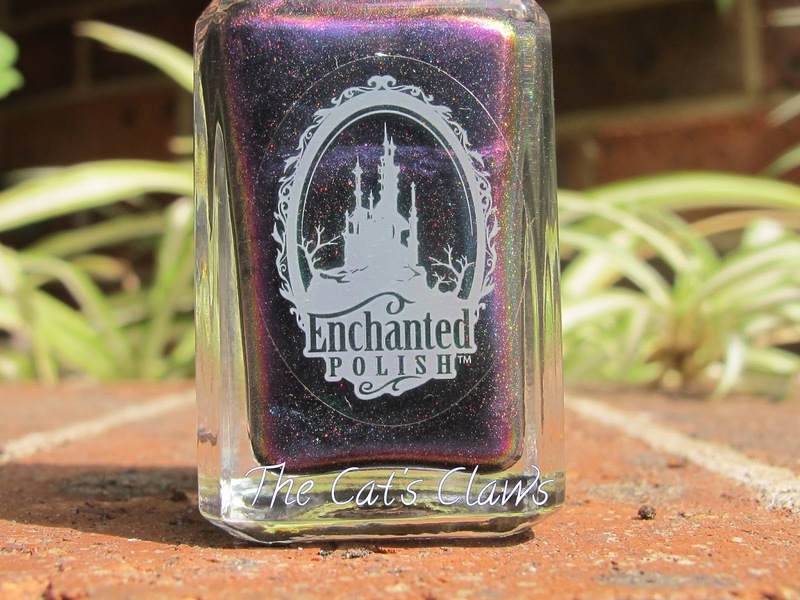 only the blue and purple and next to none of the holographic sparkle. Oh well c'est le vie! as the French say. On to my mani then I very thin coat of Amazeballz Holo! which has holographic particles in it as well as the metallic flakes that all Amazeballz have, making it extra sparkly if there ever could be such a thing! Then stamped with Born Pretty BP 41 using Kleancolor Metallic Black. I used a different topcoat and I've noticed its pulled my stamping a tiny bit which is not actually that noticeable in real life. Anyway I really love this mani and I'm still wearing it now a week and a half later! 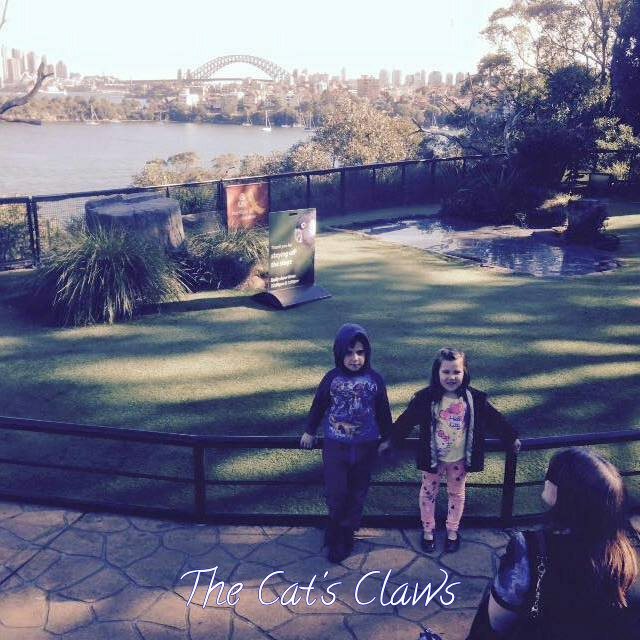 My daughter and her entourage paid us a visit during the school holidays just gone, and we all had to have our nails painted! 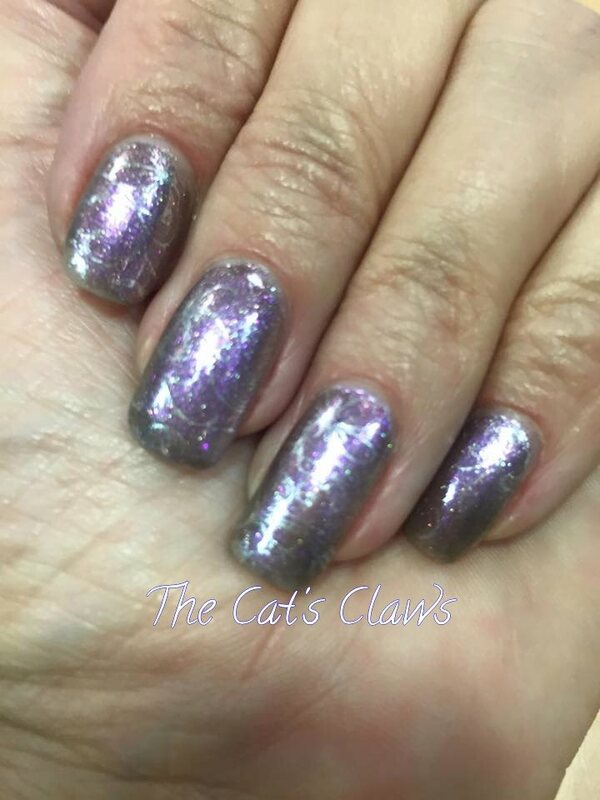 My daughter not known for her love of glitter enquired upon the glitter I was wearing which was the stunning Pretty Serious Daphne's Garden Party a glitter mix of apricot, lavender, silver, turquoise and violet hexs in a clear base. 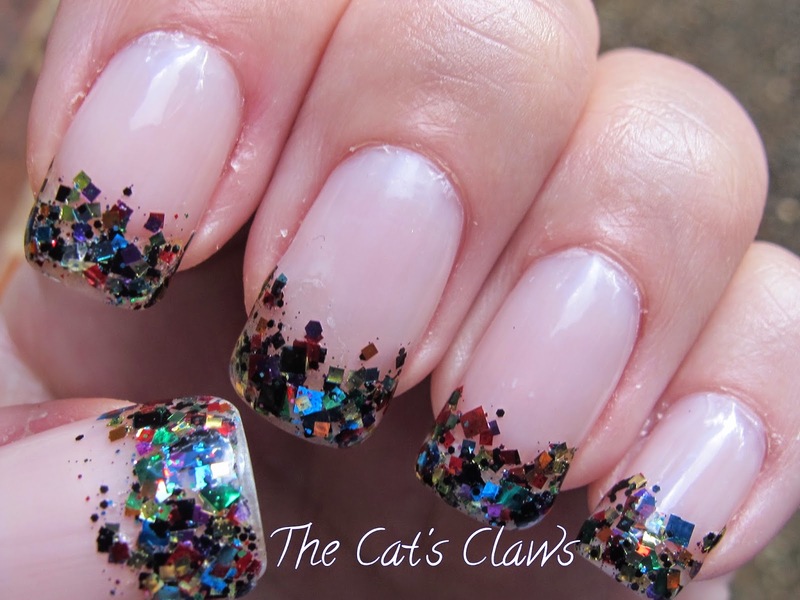 In fact all the colours you would associate with a grand Garden Party, and declared she would have a full mani of glitter! Not only that when I showed her the Pretty Serious website she declared I should also get Daphne's Disco! Miss 5 went down a different route and after checking out ALL my stamping plates decided on bunnies in red! As her nails are so tiny I was only able to use the bunnies head from MoYou London Festive Collection 09 with Barry M Gelly in Blood Orange. We also spent a wonderful day at Taronga Zoo and if you do happen to find yourself there, the bird show is spectacular. Well as soon as I saw the first Internet pictures showing a green Chanel polish I had to have it! And Chanel Fraicheur has not disappointed me at all. Fraicheur is a beautiful spring green colour with a blue shimmer which is very subtle on the nail, but it does give a glowy look to the polish. I came to nail polish addiction late so I missed out on Chanel Jade and having done some research on the Internet Fraicheur is not a dupe. Two gorgeous coats later with a Seche Vite top coat and we have perfection, Chanel Fraicheur is so beautiful, I ended up wearing this mani for two weeks! One of my customers a self confessed gold freak said she had spotted my nails from across the room, they were that blingy! So what have I actually got on my mitts then? 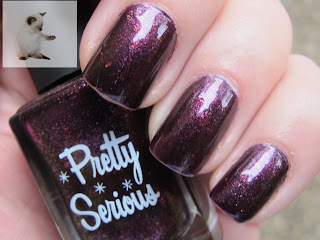 It is actually two coats of Lacquistry Amazeballz You So Fine! The most beautiful pale gold ever invented. Followed by Seche Vite topcoat and that's it. I've had this on my nails a week now and I'm not planning on taking it off anytime soon, so I might just stamp over the top of it for next week. Labels: Amazeballz, Lacquistry, You So Fine! OPI Next Stop... The Bikini Zone you are so beautiful, but a real bugger to photograph well! Mind you I don't think it helped having the Born Pretty Silver stamped all over it as that totally blinged out my camera settings. 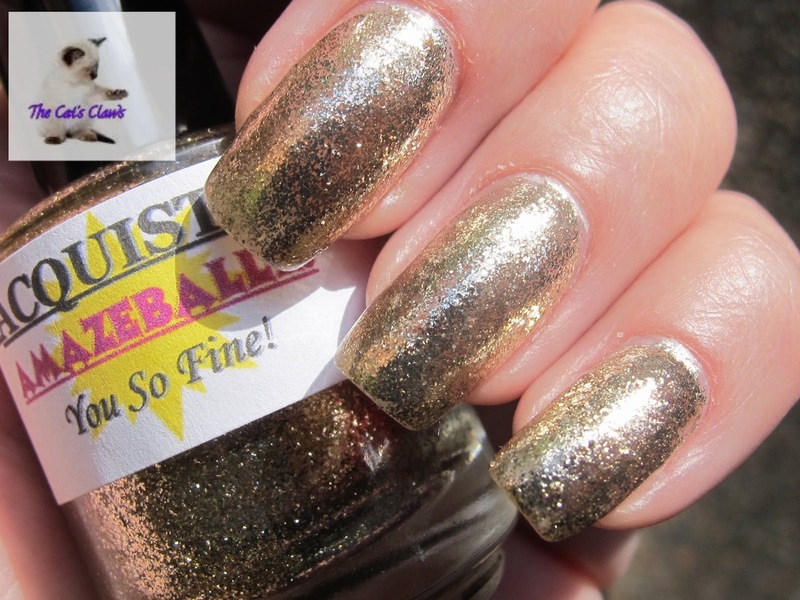 You will just have to trust me that this is a really pretty polish being a duo chrome and super sparkly. Oh well moving on, this was three coats. 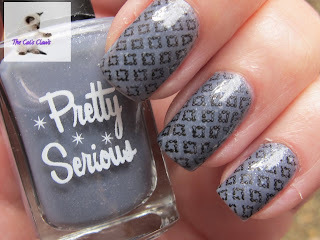 I then stamped a very delicate design from JQ 06 using Born Pretty Silver stamping polish which is a very bright silver! Lastly a photo taken at work using an iPhone which shows the true colour of OPI Next Stop... 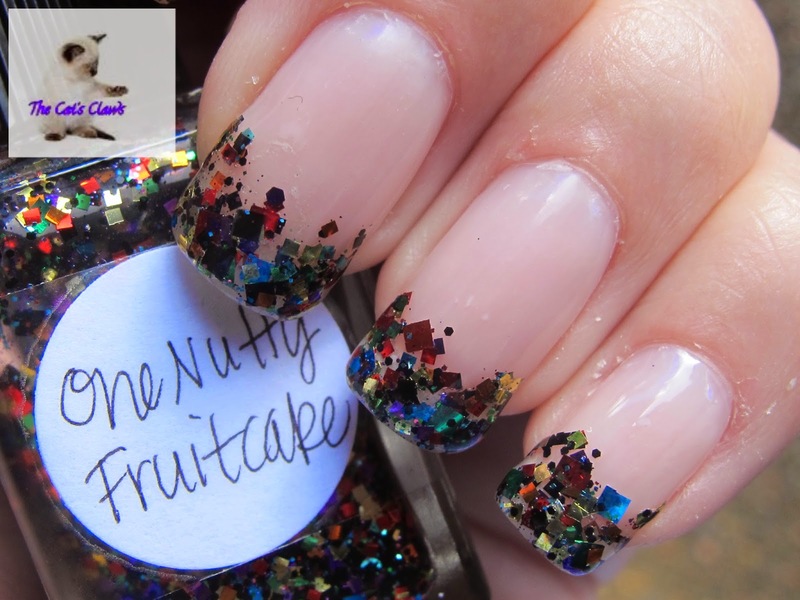 The Bikini Zone and how sparkly and full of life this mani actually is! So for my mani this week I was pondering on what to do, as you do when you can't think of a single thing. When I thought glitter tips! And then I remembered there was a bit of fuss about the following picture. 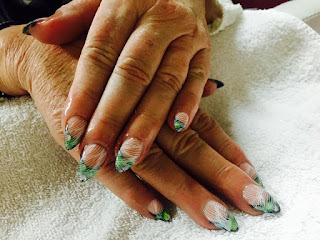 It wasn't exactly about the mani but about old hands! I for one would love to know the age we have to be before we are to stop taking care of ourselves or wanting pretty things! The lovely Jess in a group I follow on facebook posted up a picture of the mani she had created for her mother-in-law. 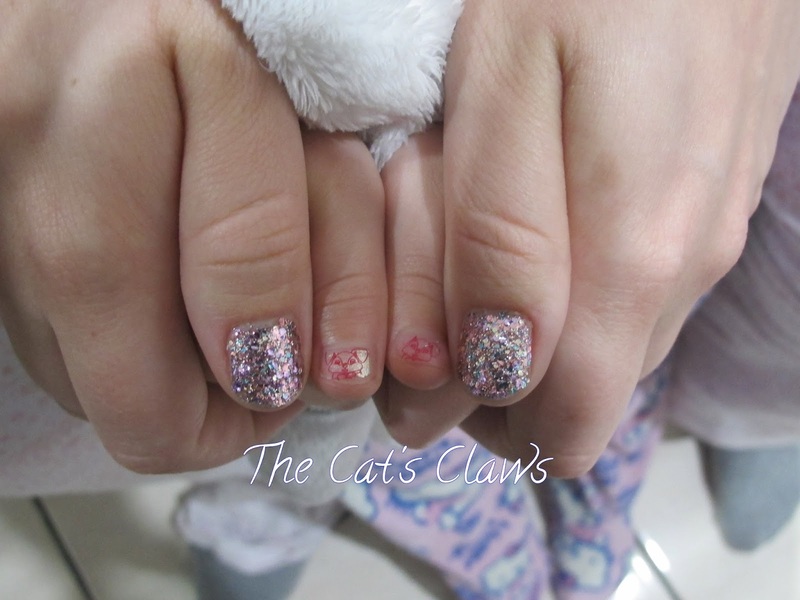 The mani itself took a fair amount of time to create being quite complex and highlights Jess's creative flair. (I've just used polish to recreate something similar) Wherein certain people suggested she should have used a better model, with nicer hands etc. All I could see was a perfect mani that was really pretty and one that I would like to recreate for myself. On to my mani then, a clear base of Qutique Gel then a french tip using Barry M Gelly Blue Grape with Pretty Serious Moments Til Midnight dabbed on top. 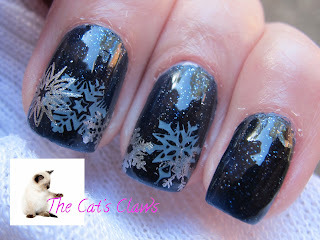 And then stamped with hehe 028 using Mundo De Unas White. 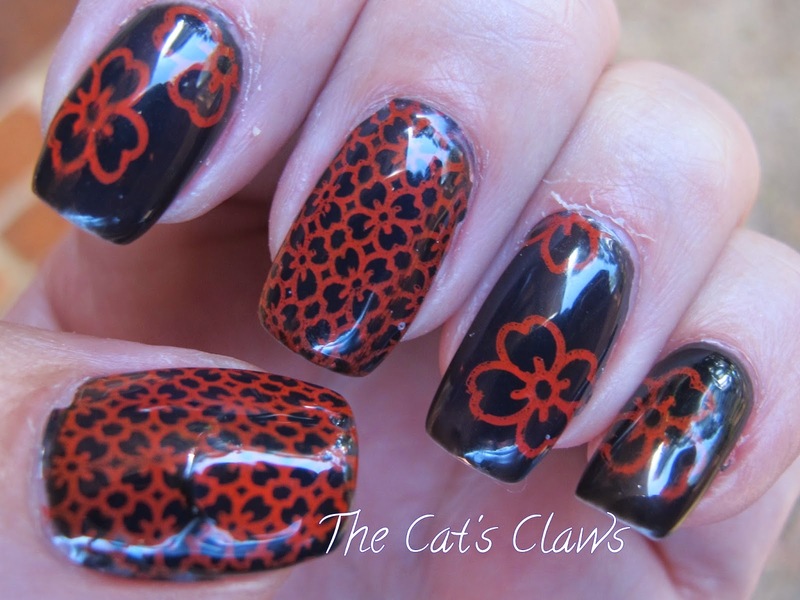 Followed by Glisten n Glow HK Girl topcoat to protect the stamping. 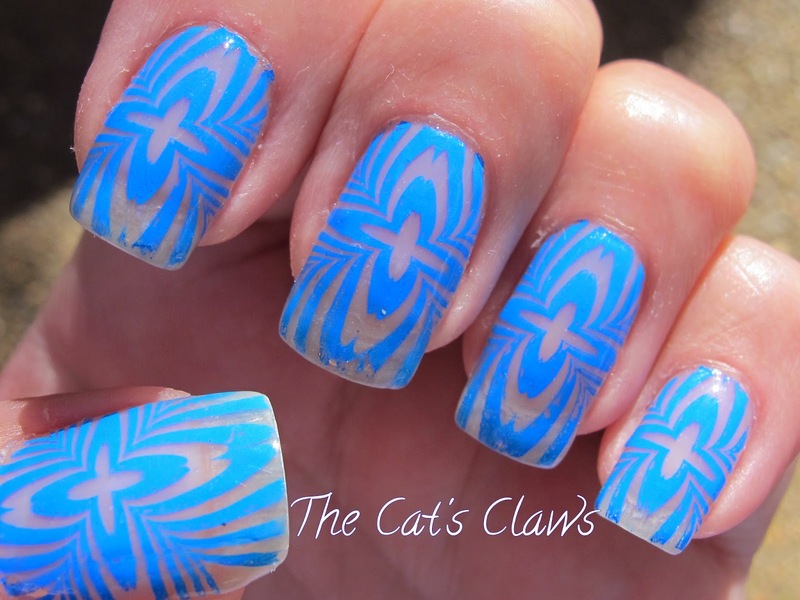 I was unsure if the flowing white lines would detract from the mani, but in actual fact they enhance it and I have already had many compliments for this mani its just so striking in real life! 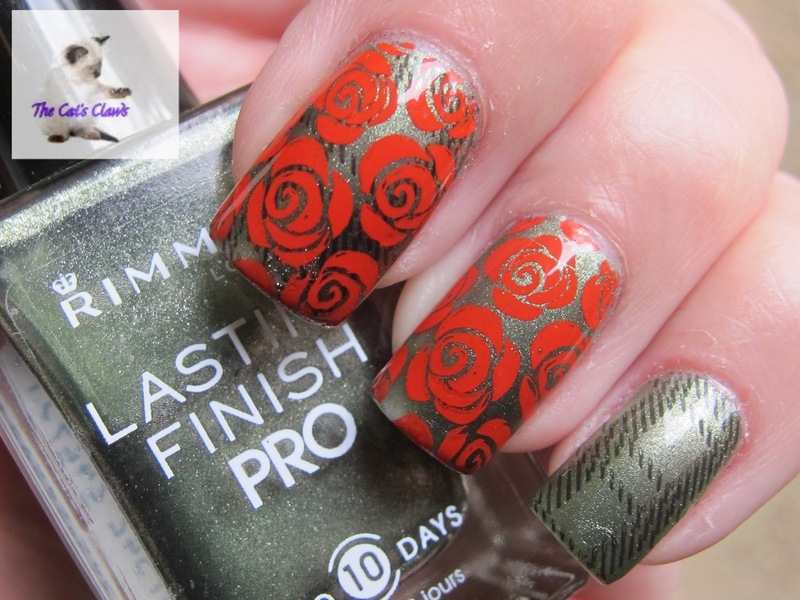 If ever there was a polish screaming out to be British tweed then Rimmel Lasting Finish Pro Rags To Riches is it! And of course we needed the English Red Rose too. 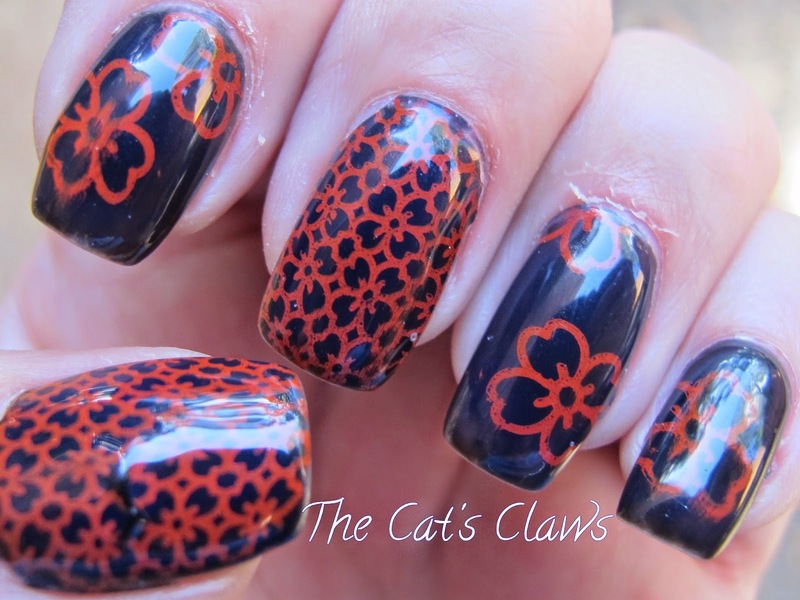 I was so pleased how this mani has turned out, as I fear I have rather lost my polish mojo for a while. On to my mani then three coats of Rimmel Lasting Finish Pro Rags To Riches a lovely greyed out green which also has a soft sparkle in it too. I then stamped the tweed pattern from hehe 028 on to my thumb, index, middle, and pinkie fingers using Ulta3 Black Satin. 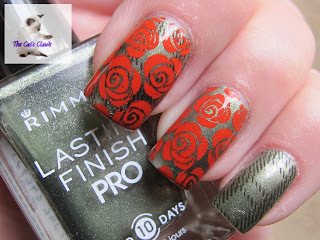 I then stamped the rose image from MoYou London Pro Collection 07 onto my thumb and ring finger using Mundo De Unas #32 Reddish. 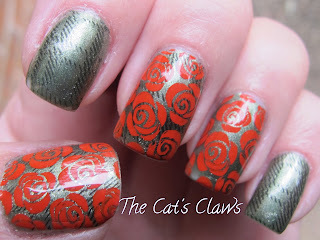 (I had to stamp the rose image on to my middle finger nail too as I had smudged it grrr). 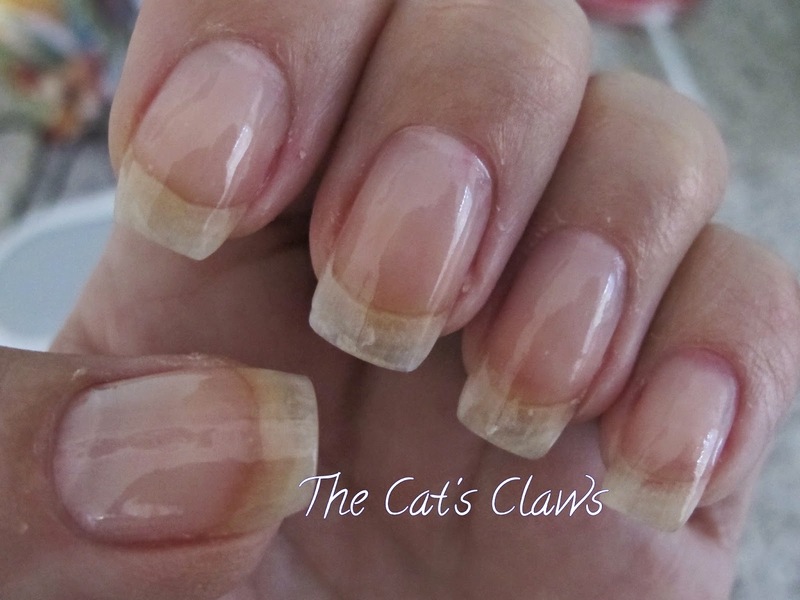 I then top coated this mani with Qutique gel as I intend to keep this mani on for some time as I love it that much. 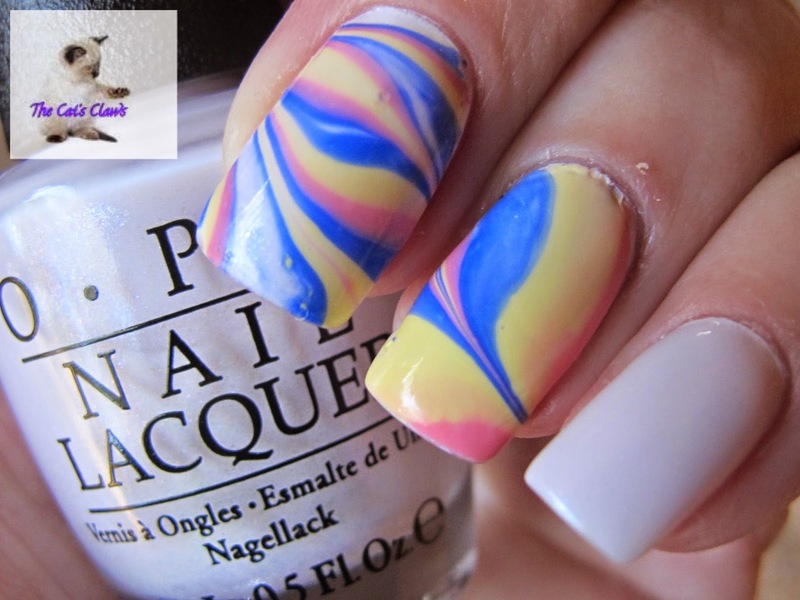 OPI Petal Soft by name and Petal Soft by nature! 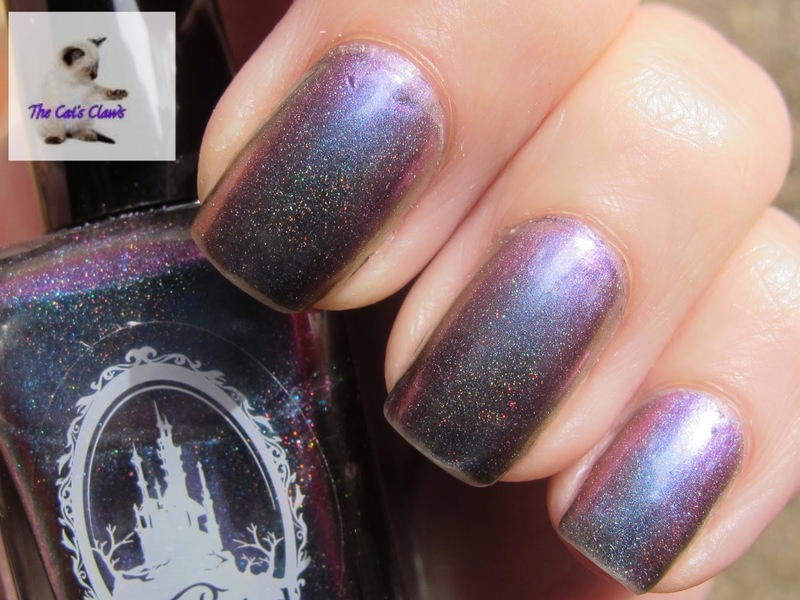 This is one of the glitters I picked up from the new OPI Soft Shades collection. It has white satiny petals and pale baby pink satin hexs with tiny white satin dots all suspended in a clear base. None of the glitter, glitters! 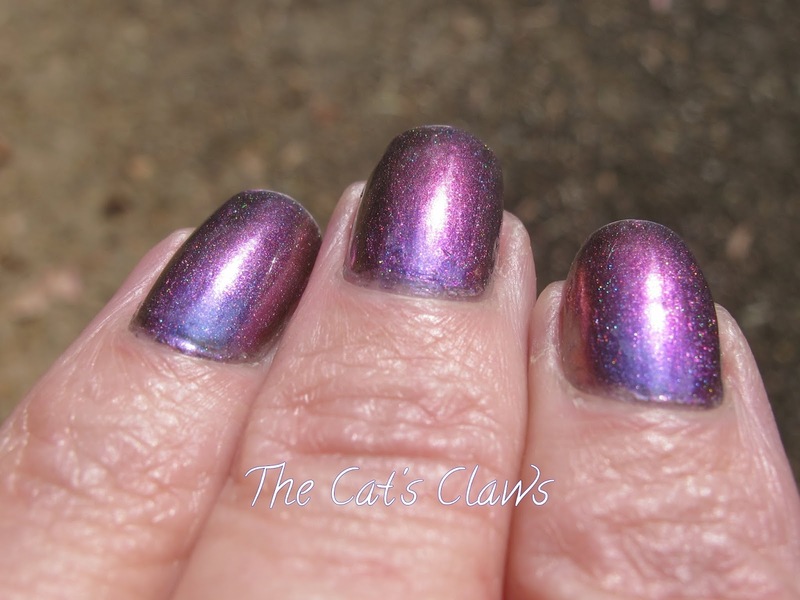 OPI Petal Soft is just exactly as the name suggests, soft! 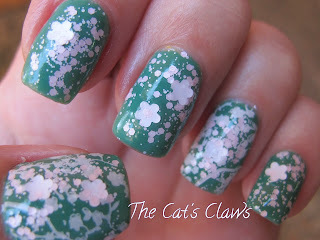 Firstly dreaming of Spring already when Winter has not even started yet, I did three coats of Ulta3 Emerald Inten-City a beautiful emerald jade green. I stamped on my thumb and ring finger using MoYou Pro Collection XL 11 with Mundo De Unas White using the pretty spring blossom image. I then carefully dabbed OPI Petal Soft on top and I must just say the petals were very easy to fish out too. Finally a top coat of Seche Vite and I was good to go. OPI have bought out their new soft shades and I picked up the three that appealed to me most. 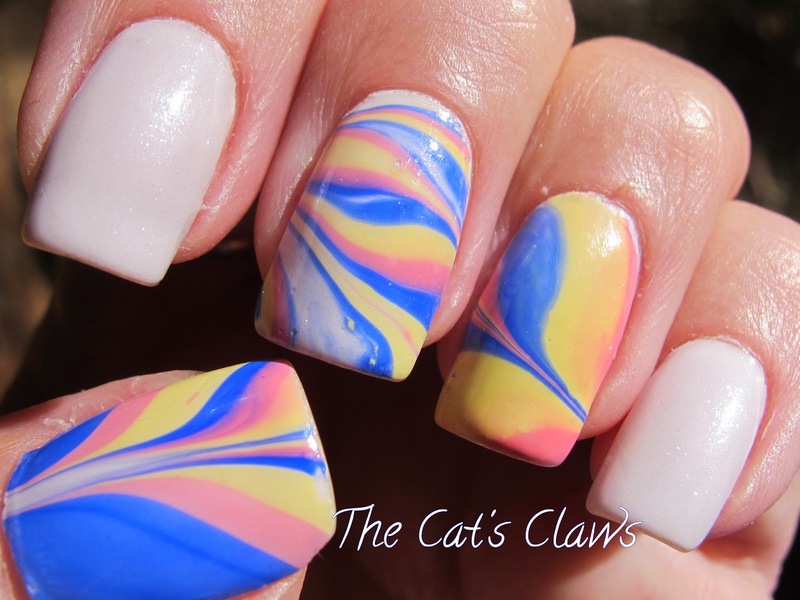 Here is Chiffon My Mind a soft white with just a tinge of pink and a beautiful blueish delicate shimmer. Without top coat this dries to a satin like finish which I just loved. After a day or two of OPI Chiffon My Mind mani, I thought I would have another go at water marbling! I left a cup of water sitting out over night and then just added some tepid water from the kettle when I started. I used Ulta3 Blue Marlin a royal blue, Candy Mohair a peachy pink and Lazy Daisy a beautiful creamy yellow. I think another secret is to work quickly with the dropping in of the polish. I am just so pleased how these turned out. 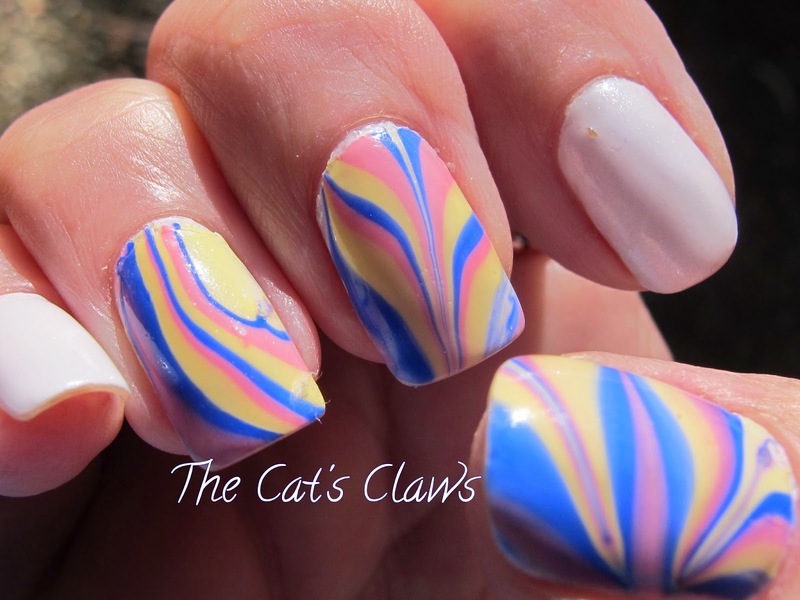 But, isn't it always the way that by the time I had got to my right hand the marbling was starting to look better! What surprised me most about my mani was the number of comments I received at work, I thought this was anything but perfect, but it seems the customers were of a different opinion. 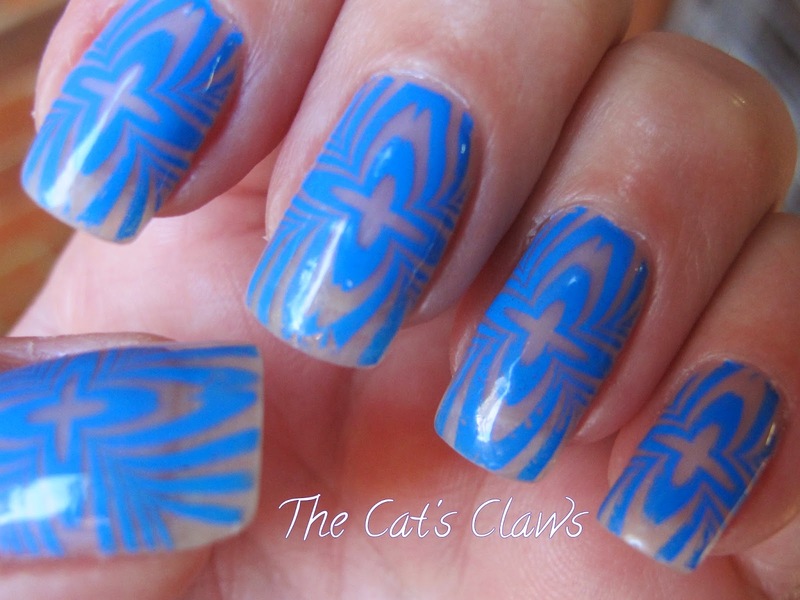 Well I thought I would try a negative space mani! I decided to use Mundo de Unas #4 Blue rather than the more normal black. From a distance my mani looked totally blue and the only way you could tell it was a negative space mani was in a close up so I think this was rather a fail to be honest. I really don't know what I was expecting though. And the tip wear was decidedly marked after about three days. 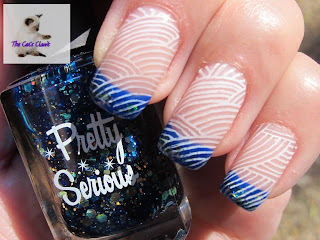 On a more positive note, I just love this Born Pretty stamping plate BP 11 which features some cool patterns that are reminiscent of the 60's psychedelic era. So I had just done my nails with Qutique Gel using the base and top coat. Yes really! my nails are that pale, that the moons do not show up in photos let alone real life. Anyway moving on, I then went out to get coffee sans a complete mani while I waited for inspiration to strike. 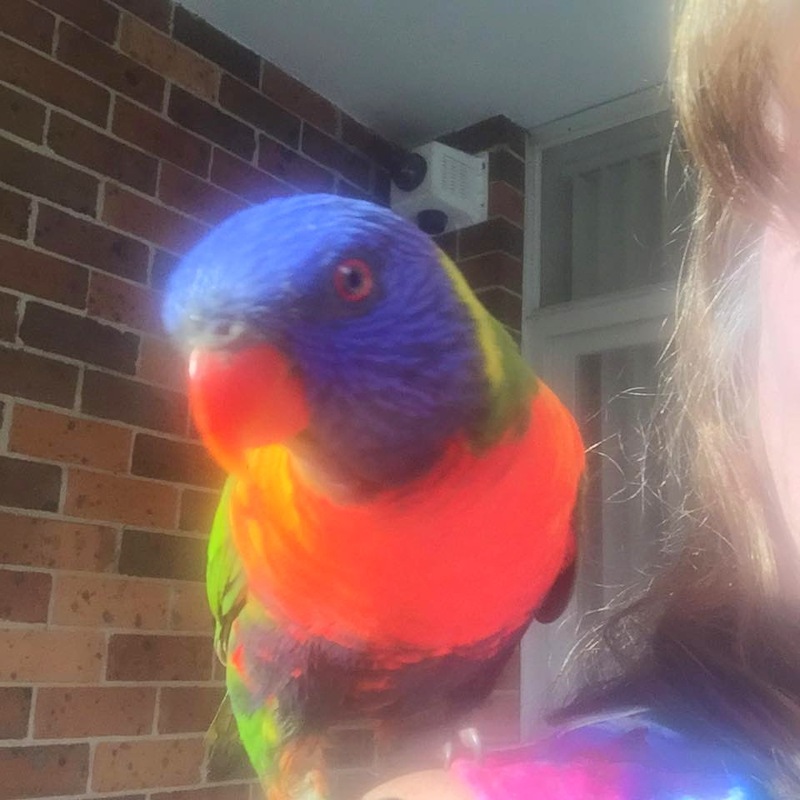 When I came back, the Lorikeets that we feed were screaming for their food, and as I was taking pictures of them feeding one landed on my shoulder. I quickly switched the camera and took a selfie with him! And that is the inspiration for this weeks mani! 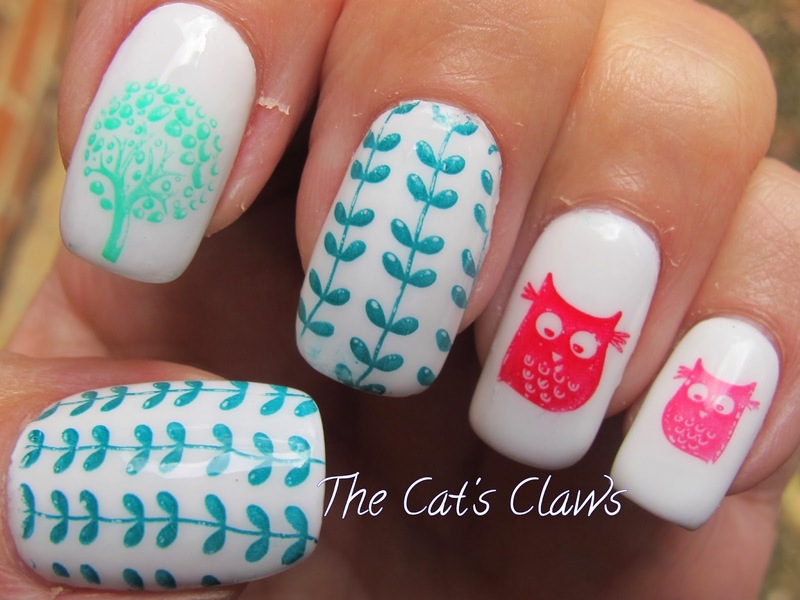 So anyway, I came across Messy Mansion MM19 stamping plate and I had my cute owls on my mitts instead! 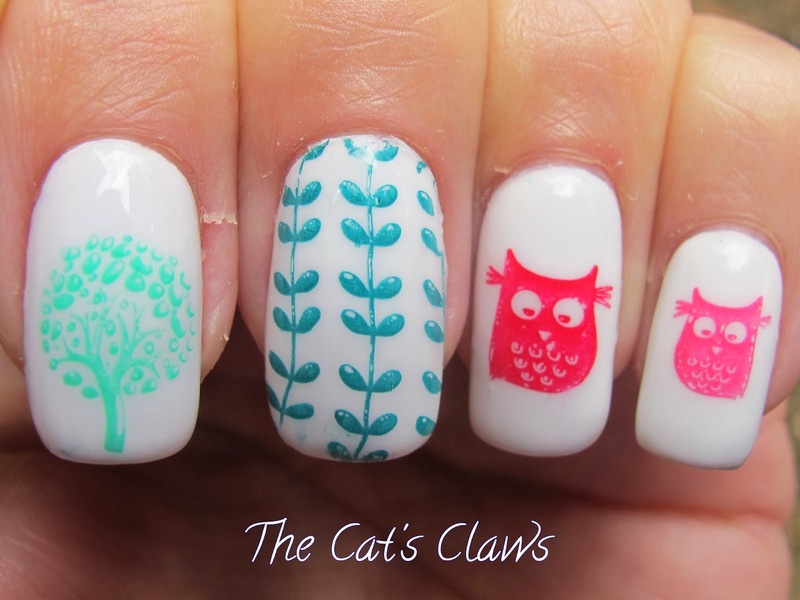 This is Quitique Snow White for the background and I used Barry M Gellies starting with Kiwi on my index finger, Watermelon on the middle finger and thumb, Blood Orange for the larger cute owl on my ring finger and finally Pink Punch for the smaller owl on my pinkie. As you can see the Barry M Gellies stamp exceptionally well, and my application or technique could use a little work. I'm so in love with this mani, it was just perfect! I thought it looked very Aztecy. This was Qutique Shadow on thumb, index and pinkie, with two coats of Revlon 1000 Volts on my middle and ring finger. 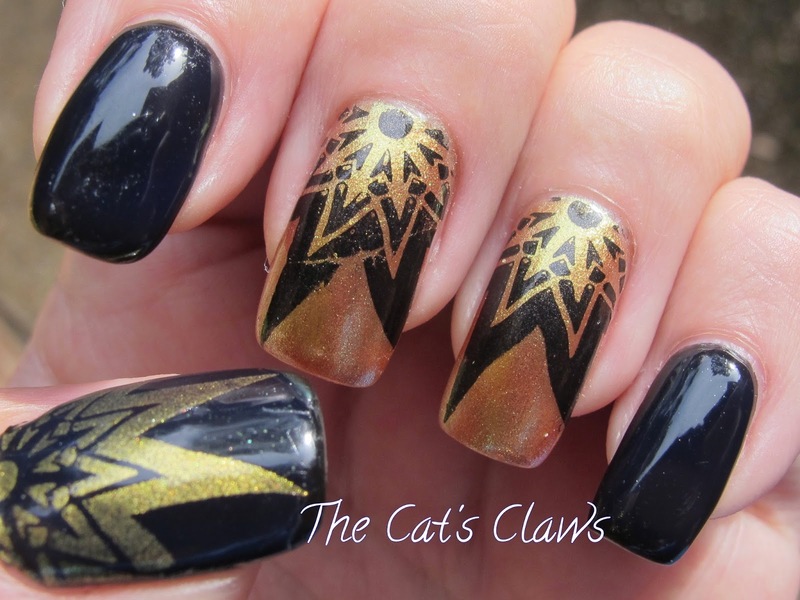 Stamped with MoYou London Kaleidoscope Collection 08 using Kleancolor Metallic Black on my middle and ring fingers and Kleancolor Metallic Yellow on my thumb. 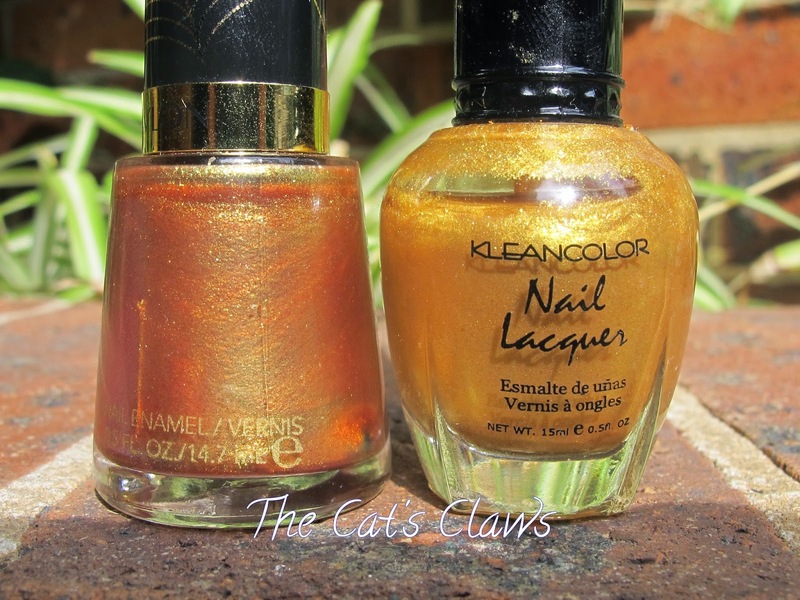 And a side by side shot as Revlon 1000 volts didn't stamp or show up very well being thinner and made using two pigments namely yellow and orange. Kleancolor on the other hand stamps amazingly well being thicker and just the one pigment yellow. You can't go wrong with simple! 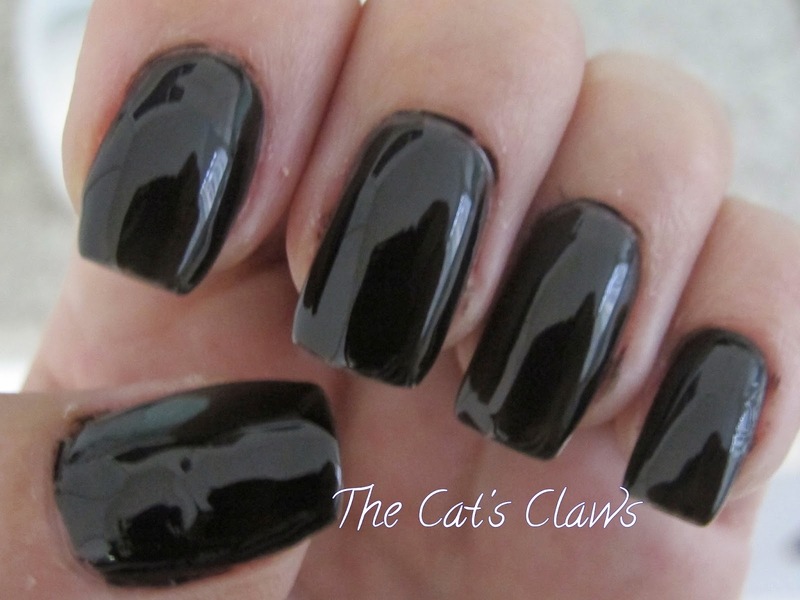 And I really like this mani after some terrors. Anyway moving forever upwards and onwards. 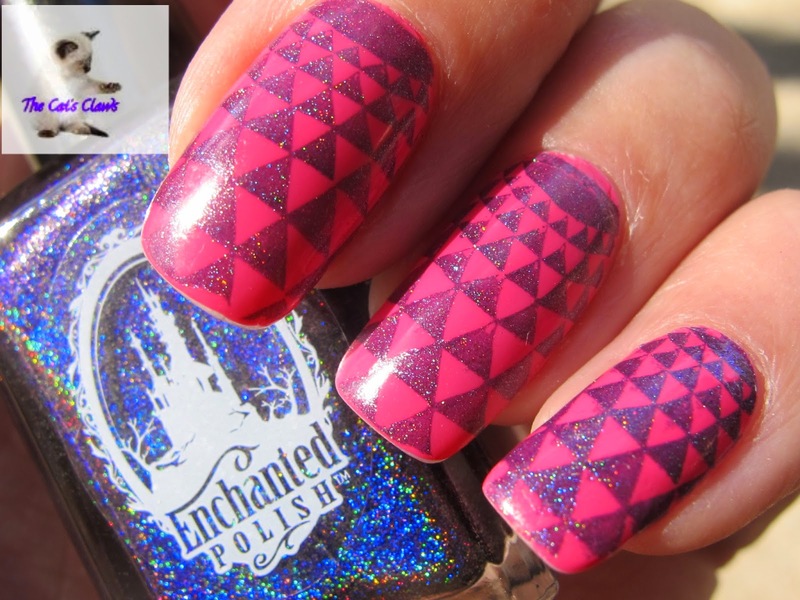 This mani is an optical allusion, it looks like the accent nail is a pink gradient when its not! I really love other peoples subtle gradients so I was pleasantly surprised that this happened. On to my mani then Qutique Shadow stamped with MoYou London Kaleidoscope Collection 20 using Mundos de Unas #15 Mexican Pink. Then top coated with Qutique Titanium Power Gel for that super slick glossy look. Well I don't know what happened there, my photo's were all in my editing application waiting to be done when I was distracted by I don't know what?? And long story short I didn't post about my mani last week! The up shot of all this is you get two this weekend. 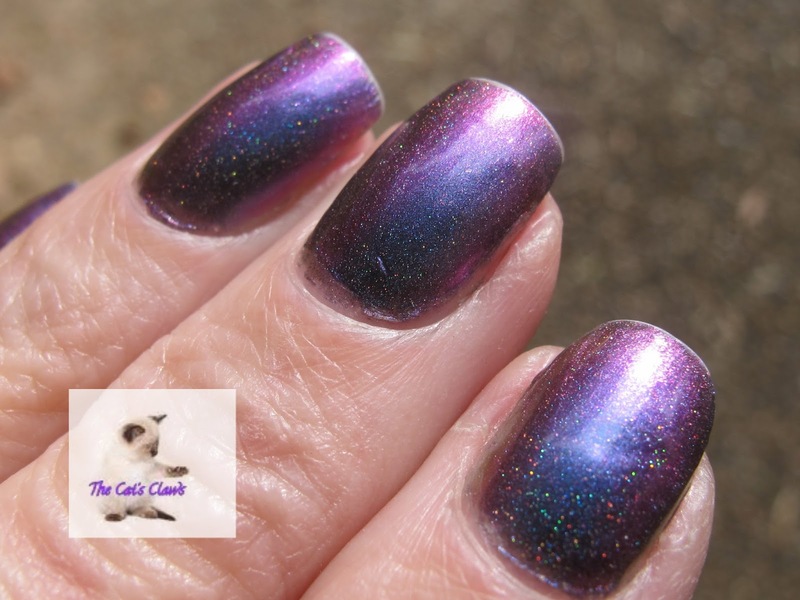 On to my mani then, two coats of Barry M Pink Punch stamped with MoYou London Kaleidoscope Collection 08 using Enchanted Polish Dark Fantasy a lovely holographic purple. 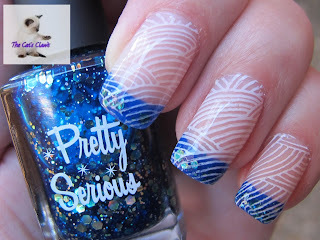 I love using holographic polishes to stamp with they make your nails look like jewels. Topped off with a coat of Glisten & Glow HK Girl Top Coat my new favourite. 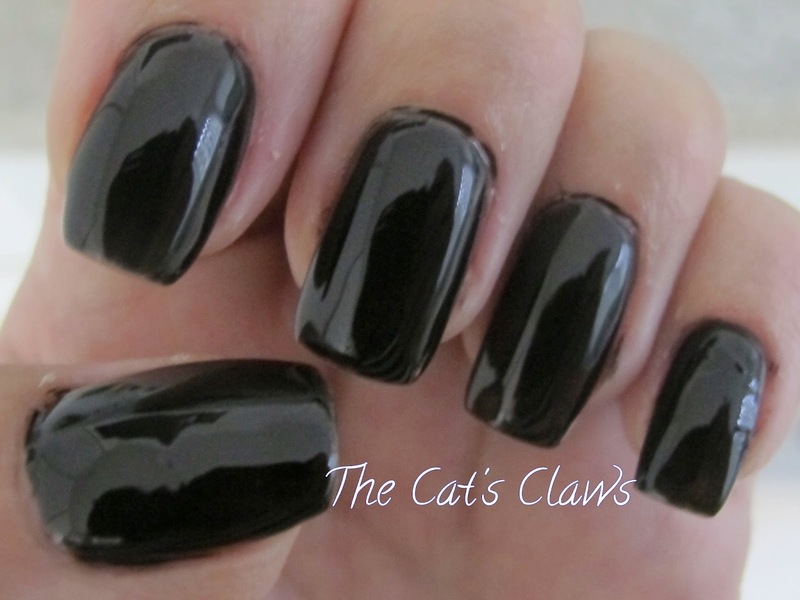 Qutique Gel Nails = Perfection! One layer of Base Coat and 20 seconds under the LED lights and look how shiny my nails are all ready! First layer of colour, here I have used Shadow a dark charcoal black, 20 seconds under the lights. Second layer of colour and you've guessed it 20 seconds under the lights. Finally the Top Coat and one minute under the lights. And then a quick wipe with acetone leaves a nice glossy finish. A trick that I have learnt is to completely do one hand first and then the other it seems to have sped up the process a bit. 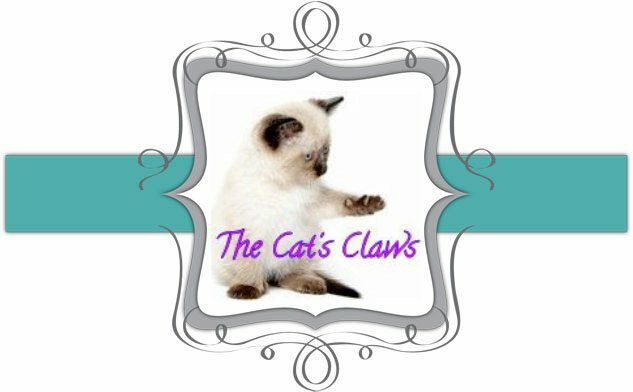 To clean up I smother my nails in hand cream and then wash that off, which lifts bits of gel stuck to my skin and then gently file any other bits off. 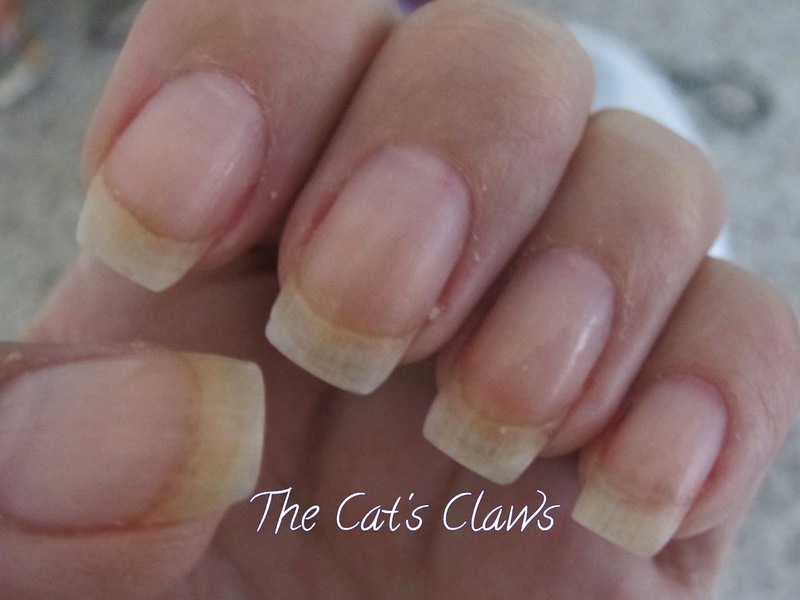 And could I have left my nails like that? 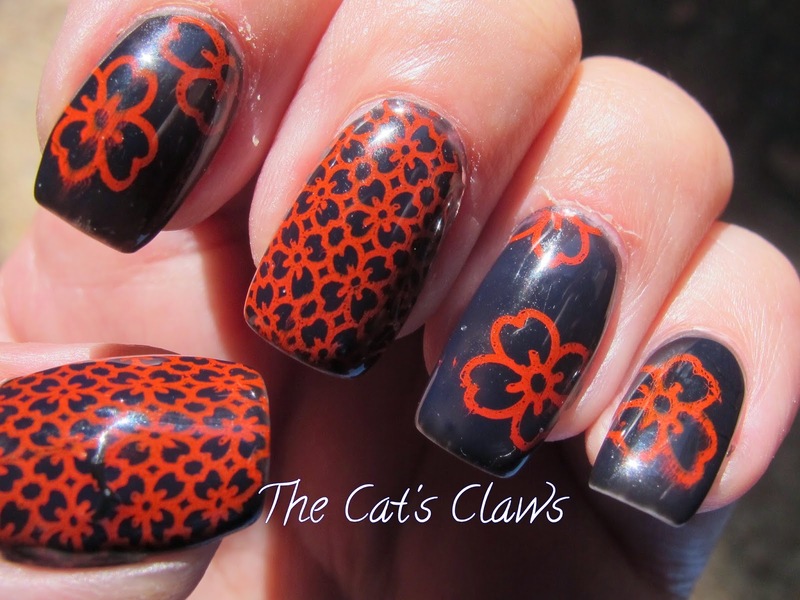 No (lol) So I stamped Fab Ur Nails FUN 13 using Mundo De Unas #32 Reddish. In the past I have used Seche Vite to top coat my nails but that always seems to smear my design on top of these gels so I have been using Glisten & Glow H K Girl which seems to work better. And then finally another gel Top Coat and one minute under the lights, wiped with acetone to remove any residue and my nails are super glossy!